New Chapter 11 Bankruptcy Filing - Aegean Marine Petroleum Network Inc.
Aegean Marine Petroleum Network Inc. ($ANW) is now subject to a fraud probe by international auditors. This thing will be in a bankruptcy court near you before too long. We didn’t expect that prediction to come to fruition so quickly! Admittedly, Aegean, one of the world’s largest independent marine fuel logistics companies with 57 owned and chartered vessels, has been a slow moving train towards bankruptcy for some time. The recent revelation of fraud — yes, fraud — is just the cherry on top. (PETITION Note: in frothy times come desperate shenanigans. This won’t be the last bankruptcy filed in the near-term that, in part, will have an element of fraud in the story.) And, alas, earlier, Aegean Marine Petroleum Network Inc. and 74 affiliated debtors filed for bankruptcy in the Southern District of New York. The more immediate trigger? The maturity of its 4% convertible unsecured notes. Aegean intends to use the bankruptcy process to address its capital structure (namely the maturity), stabilize operations and sell to Mercuria Energy Group Limited, a private company that, back in August, became the sole lender under both the debtors’ US and Global credit facilities. 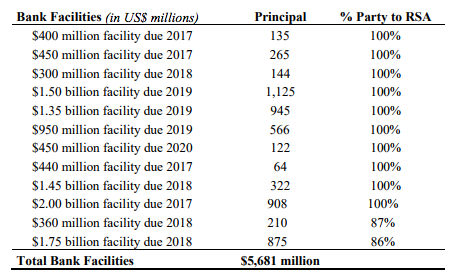 Mercuria also provided a DIP proposal that consists of a $160mm US credit facility, a $300mm global credit facility, and a $72mm term loan that the debtors deemed better than a proposed facility from an ad hoc group of unsecured convertible noteholders. The question will be to what degree a more robust and competitive sale process emerges now that this thing is finally in bankruptcy court. 4/17/17 Recap: Private equity-owned Iracore was able to consummate an out-of-court deal whereby its noteholders obtained substantially all of the equity in the company. The company, a Minnesota-based supplier of pipe and wear materials utilized in oil sands and mining applications, had $125mm of debt stemming from an LBO.